Do I need a rubber crib mattress, or will an innerspring organic crib mattress be fine? Home > Blog > Do I need a rubber crib mattress, or will an innerspring organic crib mattress be fine? Choosing the perfect organic crib mattress for your new little bundle may seem like a daunting task, given the number of choices out there. Here is some information on organic crib mattresses made from natural latex/natural rubber and natural innerspring mattresses that will hopefully make the choice a little easier. 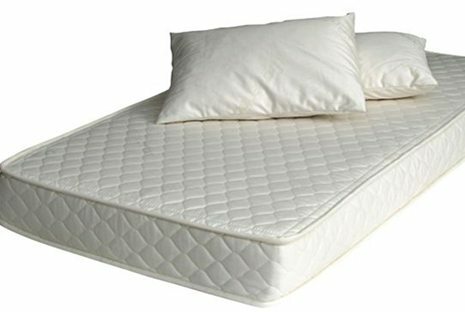 Natural latex crib mattresses have a 4.5 – 5 inch (depending on manufacturer) core of firm natural rubber surrounded by a quilting made from wool encased in organic cotton fabric. The natural innerspring crib mattresses we carry are made with an average of 250 – 260 coils (depending on manufacturer) surrounded by thick layers of organic cotton batting and an organic cotton and wool quilting. Both the natural innerspring mattress and the natural latex mattress are considered firm, and provide a supportive, comfortable feel for newborns. Neither are treated with any chemical flame retardants, as the wool acts as a natural flame retardant. We almost always recommend natural latex/natural rubber mattresses for adults. This is because natural latex/natural rubber not only allows for good support, but also much better pressure relief without sacrificing that support. Babies are light, and don’t need the same kind of pressure relief as adults do. Either an innerspring crib mattress or a natural latex/natural rubber crib mattress will be firm enough to offer plenty of support for your baby and the firmness of both is regulated by the CPSC (Consumer Products Safety Commission). Natural latex/rubber mattresses are also recommended for adults because they don’t form a body impression like an innerspring mattress will. Again, because babies are so light, and because the innerspring mattress is so firm, compression really isn’t an issue. I would recommend a rubber crib mattress over an innerspring crib mattress if there are known allergies to dust mites, as innerspring crib mattresses use cotton batting which is a medium where dust mites can grow. A rubber crib mattress is firm, and firm enough even for newborns, but will also flex and bend, which some parents may find a little disconcerting. Based on the quality of materials that are used, comparable firmness levels and the fact that neither type of mattress uses any chemical flame retardants, choosing between a natural innerspring crib mattress or a natural latex crib mattress is really a matter of personal preference. With either choice you can be confident that your baby is sleeping on a firm, comfortable, chemical-free mattress.